During her 25 years in Shreveport very few people knew where the late Robin Rothrock lived. Because she was manager of Hope Medical Group for Women, an abortion clinic, she was constantly subject to harassment. Though her nature was to be outgoing and generous, she had to guard her privacy. Rothrock was a leader in the perennial struggle to keep abortion available in the region. According to a generously honorary article in the Times, her clinic was "at one time was the only abortion provider in a 400-mile area between Dallas and Jackson, Miss." Opening the clinic in 1980, Rothrock became a steady visitor to Baton Rouge for lobbying. With a background in sociology from her home state of Florida, she was an articulate and passionate voice for women's rights. Rothrock, a woman quick to smile and one able to spar with geniality, was well-traveled among the leading businessmen, politicians and physicians of Shreveport and the state of Louisiana. She enjoyed debate and challenges and felt that full extensions of women's rights, even in ill-educated Louisiana, was inevitable. "She has stuck with the effort to provide abortion care through thick and thin: clinic assaults, fire bombs, protesters, and state regulations aimed at reducing access to abortion care," wrote Pearl Serbanic in nominating Rothrock for a Woman's Health Hero award. In recent years she became a successful artist, displaying and selling visual art at one time from her Backroom Gallery in the Arodasi Center on Market St. 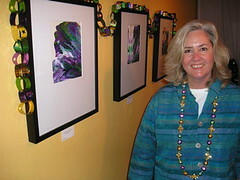 Her art was included in shows at Artspace Shreveport and Bistineau Gallery and displayed at Prima Tazza and Bella Fresca. 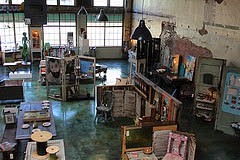 She founded Highway Grrls Gallery & Studio near her home in Melbourne, Florida. "Rothrock was president of the League of Women Voters of Louisiana in the 1980s," wrote the Times. "She remained politically active despite a four-year battle against breast cancer." 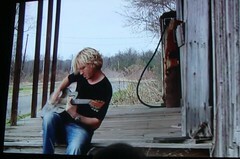 See a descriptive article on Shreveport and Rothrock in Mother Jones magazine. Sci-Port: Louisiana’s Science Center, will host the annual New Year’s at Noon celebration on Friday, December 31, from 10 a.m. – 2 p.m. This year’s celebration highlights traditions from Imlek, which is the Chinese word for New Year and the name of the month-long preparation of the New Year for Indonesians, says Karen Wissing. Activities will include: making noisemakers, dragon puppets and clock-face painting. 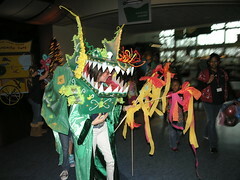 The dragon puppets will be used later in the day during the Dragon Parade which will take place inside the Center at 2 p.m. There will be a countdown to “midnight” at Noon followed by a balloon drop off of the Center’s 2nd floor balcony inside, and Sci-Port’s President/CEO Ann Fumarolo will give a New Year salutation. A fireworks presentation in our SWEPCO Demonstration Theater showing the different salts and colors needed to create a firework will also be included. The program is free with admission to the Center. From September through February, Sci-Port’s hours are Tuesday through Friday, 10 a.m. – 5 p.m., Saturday, 10 a.m. – 6 p.m. and Sunday, Noon – 6 p.m.
For information regarding hours, IMAX showings or special programs, call (318) 424-3466, toll free at (877) 724-7678 or visit www.sciport.org. 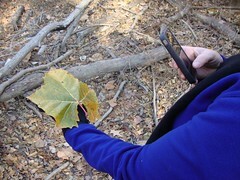 Coates Bluff Nature Trail founder Jon Soul says of the New Year's Eve hike, "Meet at the MSS parking lot off Sevier Rd. at 3 pm, walk the full-length to Valencia, maybe see a little of the cemetery, and then take the nature-loop coming back. I'm thinking that would be between 1 - 1/2 hours of walking/talking time." Those of you who need to take a shorter hike may stop and return to your vehicle at any time, of course. 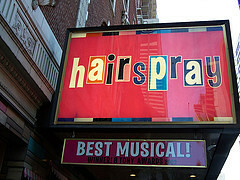 Cynthia Whitaker and Lauren Ross are directing and choreographing Hairspray at Riverview Theater, says the Academy of Children's Theater. "To feature 60 of the most talented young performers in Louisiana, ACT has partnered with Mahogany Ensemble, Theater of the Performing Arts and Yazzy," says Ross. Daniel Ley, music, Don Hooper, sets, Monica Allison & Cynthia Whitaker, costumes, Lauren Ross, choreography. Two of comedy's most famous mismatched roommates: Felix is neat, nervous and uptight. Oscar is easygoing and sloppy. When they share the same apartment, hilarity ensues. Cast: Mike Martindale, Joe Todaro, Anna Maria Sparke Keele, Susan Kirton, Jim Cowles, John F. Daniel, Warren Grafton, and Michael Stone. Open Monday - Friday from noon to 4 p.m. Call 318 424-4439. Tickets: $15. Seniors, students & active military; $17. Adults; $10 Student Rush tickets are available at curtain time, at the door with student ID—cash only. Jan 6, 7, 8, 14, 15, 2011 at 8:00 p.m. Jan 9, 16, 2011 at 2:00 p.m.
Robert Darrow directs, Rebecca Woodruff serves as stage manager, Mike Jarrett, set construction, David White, lighting design, and Diane Long, scenic artist. Coates Bluff Nature Trail is Shreveport's newest hiking path. 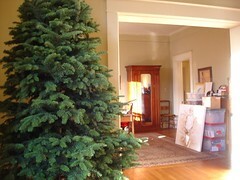 It skirts the bottom that was once the head of Bayou Pierre. On one side of the path, which is dotted with flouresecent tape markers, is a tree-covered high bluff. On the other side is a bayou bottom, some of it a pretty waterway and some of it dry. In hiking it on Dec 26 we found solitude, appealing woods, varied trees and undergrowth, good markers and enough of a challenge to feel we were on an adventure. We parked at Montessori School for Shreveport, followed the well-trod land beside the bayou until we got to the easily-spotted box of maps on a tree labeled Please Take One. We continued in the lee of the bluff almost one mile til we noticed a well-used path up the hillside, which had gotten lower. At the top o that small rise we saw Valencia Park, Magnet High and, in the near distance, the VA Hospital. We entered the Valencia/Magnet field through a gate in the chain-link fence and walked to the Valencia Community Garden. There we saw greens being tended by gardeners under the tutelage of Deborah Coleman and Grace Peterson. On our return we noticed a tombstone; there are historic cemeteries in the Coates Bluff/Olive St area that need rehabilitation. We hiked under and over tree trunks (there are round abouts, too) on our way back to the waterway that makes Anderson Island an island. Elapsed time for the relaxed hike was about 50 minutes. Members of A Better Shreveport are planning to hike the path - mid-afternoon - with trail founder, Jon Soul, on New Year's Eve. If you would like to join us, please see the A Better Shreveport blog for finalized arrangements. Or simply go and hike at your leisure. It is an inspirational bit of terrain and an easy way to check in with Mother Nature. Highly recommended for those children, too. 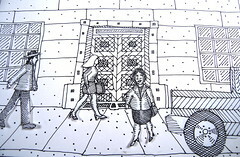 And a 2-min video here. Shreveport Green will collect Christmas trees to recycle into landscaping mulch from 9 a.m. to 1 p.m. Friday and 9 a.m. to 1 p.m. Jan. 8 at Eco Mulch and Sod, 6105 St. Vincent Ave. in Shreveport. "Recycling Christmas trees reduces the quantity of waste going to the local landfill and allows the wood to be re-used in an eco-friendly manner," a news release states. The mulch will be given to area parks and schools for landscaping and pathways. For more information, call Jennette Ginsburg at (318) 219-1888, ext. 14. 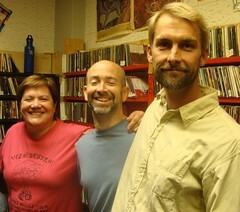 Dirtfoot is a guest on a NYC program - online and associated with Facebook - called Grooveable Feast. Hosted by hipster / singer Richard Julian, it is a righteous production. To watch the Grooveable Feasts - among the additional guests are Suzanne Vega and Josh Ritter - you simply log in. My sign-up was painless. Love it. "Shreveport-Bossier loses a unique restaurant this week with the closure of Earthereal Restaurant & Bakery, a health food store on Line Avenue where a wonderful married couple - John and Katie Koellen - handled everything from taking the orders to preparing each item by hand," writes Chris Jay in his new city blog. "The restaurant is open for two more days - they'll have normal lunch seatings (11 AM-2 PM) until Thursday, December 23, and will be open for pick-up orders only on Friday, December 24." Adds Jay, "An incredibly tiny, lunch-only spot, Earthereal always felt like some sort of secret society to me. On any given day, there'd be a dozen or so intelligent-looking people quietly enjoying their lunch. I felt smarter and healthier just for having walked in the place. John and Katie literally knew every customer by name, it seemed, and if Katie had a moment's downtime, she'd move from table to table saying hello." Not only did John & Katie manage the longest-lived vegetarian / health food restaurant in town, they had a salon. As described by Chris Jay above, the small eatery was a haven and meeting place for artists, civic activists and students as well as the swell class. The Koellens were additionally important by the many students hired as wait staff. Their former employees constitute an informal but considerable family. 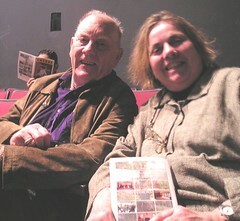 The Koellens are patrons of the arts. 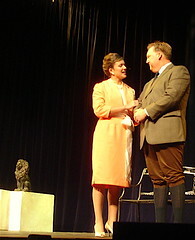 They collect art and support the scene, especially in live theater. They also established a gold standard for ethics, responsibility and warmth in their business. Though they are retiring, their have set a mark for generosity and fortitude in Shreveport-Bossier that will live long. "The Strand is on a roll," said Lily Herd,"because we sold out Fiddler on the Roof recently and today we sold out with Spamalot." Added Herd, "We had a world of calls for tickets today that we had to turn down. Additionally, every ticket that was turned in by a patron who could not attend was then sold." Spamalot was tight. The 2-hour show was marked by uptown lighting, well-honed voices and impeccable ensemble dances. 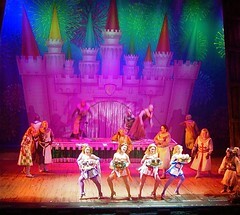 Spamalot pulled out every trick in the Broadway book, including T & A, audience participation and confetti in the air. The Shreveport Symphony Orchestra also sold out its Holiday Pops concert at Riverview Theater on the weekend. 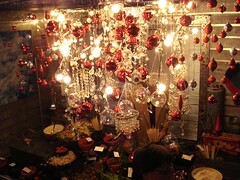 As did Shreveport Regional Arts Council sell out its vast benefit, Christmas in the Sky, last weekend. Meanwhile, what might be called the alternative audience has never been larger for events such as minicine's Xmas Under da Ground. Let it be noted, too, that most of these events have taken place at downtown venues, in the evening. Not a bad way for Shreveport to close out a difficult year. 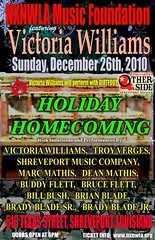 ShreveportBossierFunGuide.com is the state-of-the-art calendar for this region. You enter the event date, cost and details yourself - at Submit An Event. Add a photo and you're done. With a newspaper or other online site, you're not quite sure whether you're going to appear in print. The Fun Guide, however, gives you a guaranteed spot and quick turn-around. You also get high visibility in Google searches. As the arts admin for SBFG, I review and activate submissions daily. And I have backup people at the ShreveportBossier Convention & Tourism Bureau: Pat Gill and Patsy Zittrauer. Adjustments are not a problem when you know the arts admin. Drop me an email if there's a cancellation or a glitch. I will be happy to fix your event listing day or night. The turn-over in the arts world means that some press release personnel are new to their work. Not a problem. I'll be happy to initiate newbies and offer a helping hand where needed. This week on From the Top, says Redriverradio.org, on Sat, Dec 18, at 11:00 am, is a performance by 17-year-old violist Marcus Rose from Shreveport. Rose has been awarded a $10,000 Jack Kent Cooke Young Artist Award. On the show Marcus performs the first movement Rapsodie from Suite Hebraique by Ernest Bloch, accompanied by Christopher O’Riley, piano. Rose is a senior at Caddo Magnet High School in Shreveport. 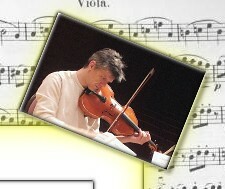 He studies viola with Borys Smolaga and also plays the piano. Marcus is a member of his church choir, plays with the Marshall Symphony, and is part of the American String Teacher’s Association National High School Honors Orchestra. 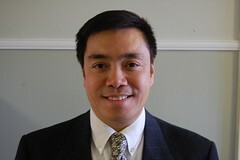 He has taken master classes with the Manhattan String Quartet and participated in the Sewannee Summer Music Festival. In his free time Marcus likes to hang out with his friends, shop, and play The Sims 3 on his computer. Special Note: Due to an Early Opera Time this show will be abbreviated. The Full show will air in its entirety on Mon, Dec 20, at 10:00 am. Charles Dickens' classic, A Christmas Carol, directed by Heather Peak Hooper and starring Michael Blake Powell. "A Christmas Carol is one of the most popular and enduring stories of all time," says Robert Darrow. December 16, 17, 18, 23 at 8 p.m., December 19, 24 at 2 p.m. & December 25 at 4 p.m.
Tickets: Adults: $15; Senior, Students, Active Military: $12. On December 25: Pay what you will! For reservations, call SLT box office, 424-4439 or MLP box office at 869-5242. "Please, come and join us in celebration of this Holiday Season at First Baptist Church Frost Chapel in Shreveport. West Edge Quartet will present 15 brand new arrangements of Christmas music from their newly released CD 'Christmas Around the World'." CDs will be available at the concert. Tis the Season, says David Nelson and his Brobdingnagian elves, for x-mas under da ground, which is minicine? 's bi-annual "Made in Shreveport" film and video showcase and multi-media exhibition. See it Sat, Dec 11 @ 7pm, 846 Texas Avenue. Sara Hebert, Bob Greenwood, Dacoda Montana, Ruthie Junto, Keturah Cummings, Noah Scruggs / Chris Armand, Marquette LaForest, Leo Kacenjar, Cazes Verbois, Jeremy Jones, Robert Trudeau, Dan Garner, Alan Dyson, Rob Peterson, Keith Able, Michelle Glaros, Chris Alexander, Skye Thorstenson, Larry Caveney, Krista McKinney, Savage Chuck, Glen Grefe, Jimmy Cousins and Austin Meyers / Mike Schwalke. Reyne Treve, Conchita Iglesias McElvee, Mallori Brandon, Dylan Hillman, Jason Pliler, Kathryn Usher, Chuck Loridans, Debbie Engle, Jeremy Johnson, Matt Beckam, Rachel Wallace, Deborah Demaree, Molly Dolly, Matthew Linn, Brandon Jenkins, Justin Clark, Ben Geisar, Rachel McDonald, Bailey Anglin, Courtney Walker, Rachel Addy, Courtney Walker, Jedediah Peppers, Casey Varner. Anderson Auditorium, says maestro Dr. Todd Gabriel. in a Christmas themed concert. 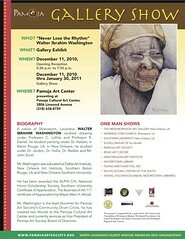 The Pamoja Society of Shreveport presents the work of esteemed painter Walter Ibrahim Washington on Sat, Dec 11, 5:30 to 7:30 pm, says Jameelah El-Amin. In addition to being a muralist and portraitist, Washington is leader of the Pamoja Drum Circle. He has also been active in the Shreveport Community Drum Circle. Pamoja headquarters, 3806 Linwood, is in the Linwood Village shopping center near LSUHSC. For more information, call 869-5235. Free and open to the public. Donations accepted on Sunday afternoon. Centenary Choir, Camerata, Chorale and Brass Quintet will perform selections during this traditional campus holiday service. Free and open to the public. Camerata and Chorale will join the Asbury Chancel Choir, soloists and orchestra. Admission is free, but tickets required - available at Airline Drive locations of Good Eats Market & Cafe and Chik-Fil-A.